Mix mashed potatoes, milk, butter, sugar, yeast, and water in a stand mixer or with a hand mixer until the ingredients are well combined. Slowly add in the flour until it forms a dough. Depending on how much moisture is in your mashed potatoes you might need a bit more or a bit less flour. Four cups was about right for me though. If your dough is slightly sticky, add more flour by the tablespoon. If your dough is dry and cracking, add water by the tablespoon. Mix dough with a dough hook on medium speed until its a nice smooth and silky dough ball, about 6 minutes. Alternately, you can knead the dough by hand for about 10 minutes. Place the dough in a lightly buttered bowl. Cover it and let it rise for 45 minutes, until the dough doubles in size. Punch the dough down and flatten it out into a rough rectangle. Fold the top over to the middle and then fold the bottom up. Fold the ends in. Flip the dough over and gently shape it into a loaf. Place it gently into a buttered 9x5 loaf pan and press the edges down. Cover the loaf pan and let it rise for a second time for 30 minutes. Meanwhile preheat the oven to 350°F. Bake loaf at 350°F for 35-40 minutes until the loaf is browned on top and sounds a bit hollow when thumped. Let the loaf cool for a few minutes, then remove the loaf from the pan and let cool completely before slicing. To be honest, it’s a rare day that I have leftover mashed potatoes after the holidays. I’m pretty sure I can eat close to my weight in mashed potatoes, so it’s rarely a problem. That said, after making this recipe I just might start reserving some mashed potatoes to incorporate into a dense and rich loaf of bread. Mashed potato bread. You read it here first. Of course, the first thing you’re going to need to make this loaf is some leftover mashed potatoes. People like to put their own spin on mashed potatoes and that makes it a bit difficult to plan a recipe around it, but I think this recipe will work for most mashed potato versions. For the record, my mashed potatoes are creamed together with lots of butter, milk, garlic, and black pepper – and they worked perfectly in a loaf of bread. I used a stand mixer to bring this dough together, but you could definitely do it by hand if you wanted. Just add all the ingredients except the flour into a mixing bowl and mix it together well. There’s a lot of yeast in this dough, which will mean a shorter rise time and a beautiful puffy loaf. Once everything is combined well, go ahead and start slowly mixing in your bread flour. 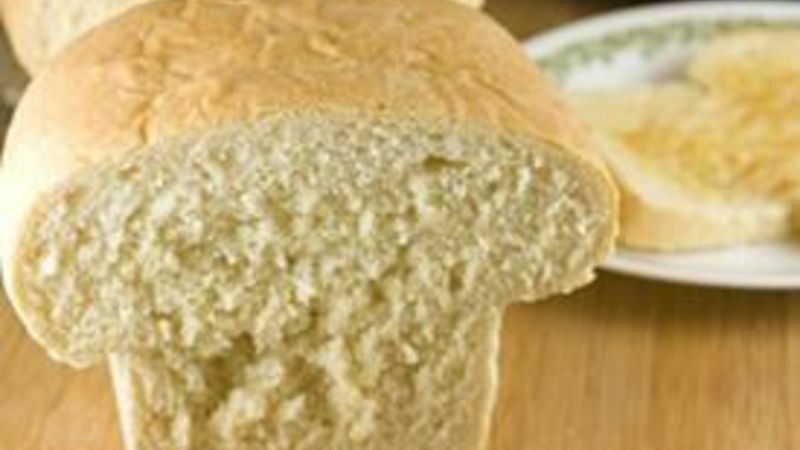 It’s important to use bread flour for this recipe because it has higher gluten content. You could make it with all-purpose flour, but the finished loaf won’t be as soft. The hard part about this recipe is knowing how much flour to add. Depending on the amount of liquid in your mashed potatoes, it will vary. I would start with about four cups of flour and go from there. As you mix the dough, if it looks really dry at any point, add in water (a tablespoon at a time) until the dough softens and comes together. Likewise, if the dough is really sticky, add in extra flour (a tablespoon at a time) until it stiffens a bit. Once your dough is a ball, mix it with a dough hook on medium speed for about 6 minutes or knead it on a lightly floured surface for ten minutes. Then transfer the dough to a lightly buttered bowl to rise. Cover the dough and let it rise for 45 minutes. It will more than double in size and will be a thing of beauty! Now it’s time to actually shape the loaf. I found this dough to be incredibly easy to work with. Start by punching down the dough and shaping it into a rough rectangle. Then fold the top into the middle of the rectangle and fold the bottom up. Next, fold the ends inward and you should have a thick brick of dough. Flip this over and you’ll have a basic loaf of bread! Carefully place this into a lightly buttered 9”x5” loaf pan and push the edges down so you can make sure the dough is in all the corners of the pan. The dough should have a really tight surface tension on the pan. Cover this and let it rise a second time for just 30 minutes. It will puff up and be awesome. Be careful not to let this rise TOO much or it will actually overflow out of the loaf pan. Bake this loaf in a 350-degree oven for about 35-40 minutes. The loaf should be nicely browned on top and sound a bit hollow if you thump it. Once it’s out of the oven, let it cool briefly and then remove it from the pan and let it cool completely on a wire rack. I can’t talk enough about how delicious this bread is! It’s rich and dense and has a mild potato flavor, plus whatever flavors you used in your mashed potatoes. In my case it had a nice hint of garlic that was really tasty. Use a bread knife to slice it into thick slices. This dough makes some of the best toast I’ve had. Try it with a BLT or grilled cheese sandwich to kick it up a notch. Nick thinks this turned out to be one of the best loafs of bread he’s ever made. And that says something. Be sure to check out his blog, Macheesmo, and follow him from his Tablespoon profile.